“Punk rock is freedom” was apparently one of Kurt Cobain’s most favored soundbites, a little bit of partisan gospel ready to be dropped as soon as a reporter’s tape recorder went click. For many of its practitioners, however, such a credo proves a hollow truth. A movement and music that says it thrives on self-expression and breaking all the rules arguably has some of the most rigid strictures of any of its contemporaries. Can you be a punk and play keyboards? Can you be a punk and sell a million records? Too many true believers — fans and musicians alike — have bought this truism completely and have fallen into the trap of allowing the bands to repeat the same musical slop. The fans and groups get lost in the nuances and forget that those same chord changes can be found on the Clash’s self-titled disc. They’ve succeeded in turning too much of what passes for punk rock today into a parody of itself. A year ago, the Thermals might have been one of these enemies of the people. The Portland, Ore., three-piece had a record, 2005’s “F***in’ A,” overburdened with pop-ish aggro-punk, heavy-guitar grinding and high-pitched ranting. The disc had some well-executed cuts and earned high marks from many critics, but its obvious defect was its unending sameness. The music was all distorted barre chords and full-throttle rhythms. The band’s most audacious efforts were some eardrum-piercing squeals of feedback above the motorized guitar chugging. Even the Ramones showed a healthy disrespect to the punk paradigm by sometimes changing up their sonic attack. It’s a surprise then that The Thermals’ new record seems to take the Ramones’ example more to heart and they seem to finally be earning some of that glowing press. “The Body, The Blood, The Machine” is a more musically diverse and an overall better bundle of songs. A punk-rock salvo that finally does credit to the name. The Thermals’ music is still enthralled with the youthful enthusiasm of punk, but maturer “shades of gray” can be heard besides the everlasting lawnmower-engine guitar chords. Nobody would confuse the Thermals with now demonstrating some Beach Boys-style ambition — much less delusions of Sleater-Kinney-dom — but the effort is unmistakable. The band recorded the album after longtime sticksman Jordan Hudson departed late last year, leaving singer-guitarist Hutch Harris and bassist Kathy Foster to track the disc as a duo. (Since the album’s completion, Lorin Coleman has taken over the drum stool.) In fact, even though the group had fewer hands to assist in the recording process, the number of instruments and layers only seems to have increased. Also deeper is the songs’ lyrical content. Defiance remains a central facet, but this disc frequently masks its political overtones and religious allusions, but obviously suggests a growing sense of unease and bafflement with George W. Bush’s America. On songs like “An Ear For Baby” and “A Pillar Of Salt,” Harris toys with the political/religious mantras but contrasts them with the hatred, fear and paranoia that some might see behind them. Musically, both songs’ charging rhythms conform to the band’s earlier pattern but with subtler hooks when there once was the monotonous pounding of guitar strings. A second guitar on the latter song serves to accent a melody buried by the thunderous volume. Melody is again the focus over zombie riffing on “Returning To The Fold.” The four-chord song bounds like a would-be Big Star classic but Harris sings with a sense of abandon that Alex Chilton has never showed. Its followed by “Test Pattern,” a quasi-love ballad that turns the guitar way down and some excellent Motown-ish, doubled-up drum beats. Harris is no star vocalist but sings with some surprising range and feeling. Interestingly, the song has a couple of long, stately, Chris Issack-like guitar solos. On “St. Rosa And The Swallows,” the band finally lives up to its pop-punk handle. The song is a literal minefield of melodic devices and vocal interludes that serve to ensnare the gullible (and aren’t we all?). A sliding guitar figure and propulsive drum pattern keep building the track’s energy. Harris, meanwhile, is buttering the listener up with fond memories and declaration of intent before the chorus, when he seeks to seal the seduction. Similarly, two of the album’s most endearing tracks are its first two: “Here’s Your Future” and “I Might Need You To Kill.” In Dylanesque fashion, “Here’s Your Future” distills the greatest story ever told and other Biblical parables to about two and a half minutes, accompanied by a buzzsawing guitar. The purpose of the lyrics is not conversion, but to respectfully chide the true believers. Harris yells, “We’re gonna create the new master race/Cause we’re so pure!/Oh Lord, we’re so pure!” The same irreverence carries over to the midtempo “I Might Need You To Kill.” Built on slippery groove of grunge riffs, Harris again seems to lampoon those who believe only their way is the pathway to righteousness. 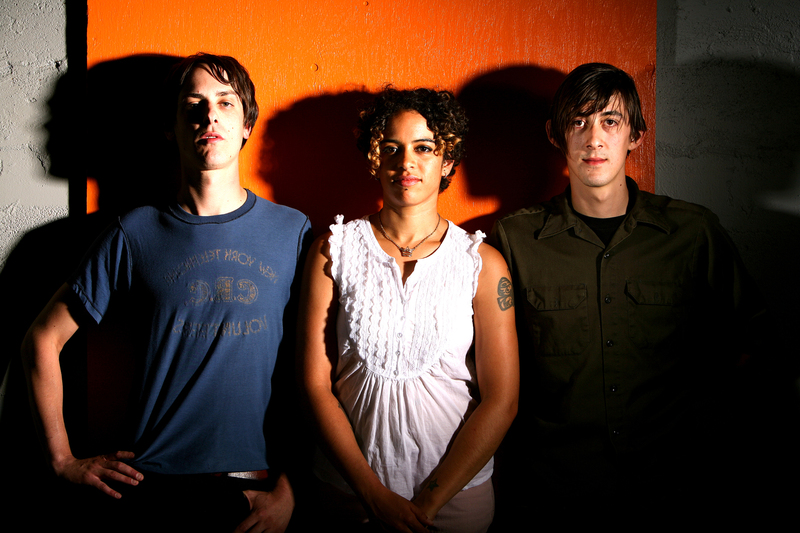 The Thermals have taken this same sense of skepticism and stylistic openness to their conception of punk rock music. And as “The Body, The Blood, The Machine” proves, their music greatly benefits from the new freedom. Tags: "The Body, Portland, review, The Blood, The Machine", The Thermals. Bookmark the permalink.